At the bottom of the copper trough (1999), a group of private investors purchased the Troy mine and the Rock Creek project, which were jointly owned by Asarco (75%) and Kennecott (25%). Shortly afterward, metal prices began to rebound and during June 2004 these forward thinking individuals would restart the Troy mine, which had been placed on care and maintenance since 1993. By December the mine and mill were producing copper and silver. In 2005, the new owners formed Revett Minerals Inc. and took the company public, launching an IPO on the Toronto Stock Exchange. The company’s name is derived from the Revett Formation, the host for the strata-bound copper-silver ore body typically found in the region. Revett Minerals owns 100% Revett Silver, which owns the Troy mine and RC (Rock Creek) Resources, Inc. Both properties are located in northwest Montana near the border with Idaho. As of December 2011, the Troy mine had proven and probable reserves of 10.53 million tons grading 1.18 oz/ton silver and 0.47% copper, which equates to 12.44 million oz of silver and 98.87 million lb of copper. The Troy mine currently produces about 1.5 million tons annually and the mill is currently processing ore at rate of 4,000 tons per day (tpd). Since its restart, significant productivity and cost improvements have been realized at the Troy mine. Revett’s future plans include bringing the Rock Creek project online. When the Troy mine was placed on care and maintenance, the Rock Creek project was at the permitting stage of a draft Environmental Impact Statement (EIS). Located about 20 miles away, in a lot of ways the proposed Rock Creek operation will resemble the Troy mine. The new mine will use a similar room-and-pillar technique to mine the lower portion of the Revett Formation. A new mill will use the same bulk sulphide process to produce concentrate. Using the experience they have gained over the years at Troy as far as mining operations, milling techniques and environmental stewardship, they hope to launch a new state-of-the-art facility. In 2012, the Troy mine expects to produce approximately 1.4 million oz of silver and 11.5 million lb of copper. Once a new Record of Decision is issued, the Rock Creek Evaluation Adit will begin the process of more clearly defining the characteristics of the ore body. The Troy mine sits below Mt. Vernon just off Montana state Hwy 56. The Revett Formation outcrops at about 4,500 ft and dips at about 10% back under Mt. Vernon. Stratigraphically, the St. Regis Formation overlies the Revett Formation, which overlies the Burke Formation. The Revett has three members: Upper, Middle and Lower Revett. There are three quartzite units in the Upper Revett (the Upper, Middle and Lower Quartzites). Each is mineralized and Troy mines from all three. The largest amount of mineralization occurs in the Upper Revett Middle Quartzite and it’s the most extensively mined member. The Troy mine has active headings in the A, C and plans to develop the I Beds of the Lower Revett. “We are mining in the A and C beds, and we are driving a decline down to the I Bed,” said Doug Miller, vice president of operations, Revett Minerals. “We hope to begin development to the I Bed by July.” At the time E&MJ visited the mine in April, crews were driving a drift through a northern extension of the C Bed before starting the decline to the I Bed. The miners drill a 5-hole burn and load it with emulsion. “The ideal blast keeps the muck pile in one general vicinity, which works better for mucking, controlling dust and ventilation,” Clark said. “We start with a 24-ft wide pilot cut and then it slabs out to 40-ft wide on final finish. We maintain 40-ft wide spans on the drifts and a 30-ft width on the cross cuts.” The emulsion works well with wet holes and also helps with water quality. “We have about 25 faces available to drill and blast, just for the top slice drilling,” Miller said. 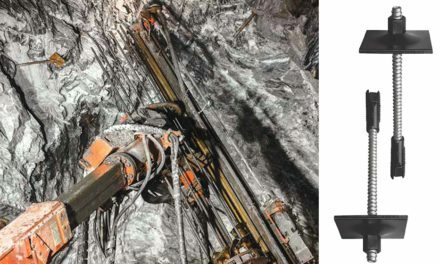 “With five trucks and three primary loaders, we have three to four active mining areas at one time.” Crews can be drilling and loading holes in one area while others are mucking in another. The equipment simply rotates between the faces. In 2008, the U.S. Mine Safety and Health Administration decreased the threshold for DPM to 160 micrograms/m3. Underground metal mines, such as Troy, had several options. They could increase the amount of air moving through the mine, add exhaust purifiers, upgrade the diesel engines, use biodiesel, or any combination thereof. “We decided to use all of the tools at our disposal to consistently meet the new DPM standard,” Miller said. “We recently completed a lengthy process of implementing the use of biodiesel. We started with B5 canola oil. Today, we are burning B75, where 75% of the fuel is Canola.” An exhausting fan at a portal in the south ore body draws 480,000 cfm of clean air through the mine from portals in the north ore body. The mine currently employs 195 people. “We have a fairly aggressive exploration plan and we have the development work, so we have a few more people working with us than we normally would and we’re looking to hire a few more for the next couple of years,” Miller said. The current life for the Troy mine is 7.5 years and 10.5 million tons. “When we restarted the mine in 2004, we had a little more than a three-year mine life,” Miller said. “Due to increased metal prices and the expanded exploration program, we ended last year with little more than seven years.” The Troy mill has to process around 100 tons of ore to produce 1 ton of concentrates. Part of current exploration program, Erickson explained, is to continue to define a continuation of the mineralization defined in the I Bed under the Troy mine to the I Bed in the new JF Property. “We performed some geophysical surveys as well as re-interpreted some previous geophysical work, and revisited the old core samples,” Erickson said. “We have done quite a bit of new drilling particularly from the south end of the mine. Then we plan to drill from private property onto the JF Property and upgrade the statistics and add more resources to our current 10 million tons.” This could significantly extend the life for the Troy mine. The ore body consists of a finely disseminated copper. A primary crusher underground (an Allis Chalmers jaw crusher) reduces ore to 6-in. A conveyor transports ore to a secondary crusher on the surface, which reduces the rock to minus 5/8-in. The secondary crushers, which consists of three 7-ft Symons (one standard and two short head cone crushers), feed a fine ore bin. The rock coming into the mill is then ground to a fine consistency (P80 = 100 microns) to liberate the minerals. The original nameplate capacity for the Troy mill was 8,500 tpd. The mill uses two fine grinding circuits, which consist of parallel trains with a 2,500-hp, 15.5-ft dia., 18-ft long Kennedy Van Saun ball mill. “We typically run around 4,000 tpd,” said Steve Lloyd, mill manager, Revett Minerals. “So, we have the luxury of running one train or the other. If the mine gets ahead of the mill, then we can fire up both trains. A potassium amyl xanthate (PAX) is used to promote flotation with the sulphides. “The mill routinely processes copper sulphides, occasionally lead sulphides, even small amounts of sphalerite—all of them will float,” Lloyd said. “We have a simple process that’s complicated by non-sulphide copper ores. Some of the non-sulphides occur as oxides, such as cuprite, or copper carbonates, such as malachite and azurite. We do not do as well as with cuprite as we do with the carbonates.” To float the non-sulphide copper, a sulphidizing agent is added to place sulphur on the surface of the particles. The xanthate then makes the particles hydrophobic. As mentioned previously, the ratio is 100 tons of feed to make 1 ton of concentrate. “We have to run a lot of tons to make money,” Lloyd said. The rougher circuit makes a really low grade copper concentrate (5% to 7% copper). That reports to the cleaner circuit, which is about 1/5 the size of the rougher circuit. “We take the rougher con and dewater it in a thickener, regrind it down to 45 microns (325 mesh), and then feed it to the cleaner circuit, which upgrades the 5% copper concentrate to 35% to 40% copper concentrate,” Lloyd said. “Our final cons are thickened to 50% solids and then they report to a drum filter. We usually make a con of 12% moisture. We now have a saleable product.” The concentrate is hauled to a rail siding in Libby, Montana. The Troy mill yields a really clean copper concentrate. It does not have the usual impurities associated with sulphides, such as arsenic, antimony, bismuth, mercury, etc. It is highly sought after. Revett recently shipped 5,000 mt to South America. In March, they shipped more concentrate to a smelter in Hayden, Arizona. The Revett Formation has a small amount of chloride in the form of mica. Lloyd suspects that during the roast, chlorides are fuming and tying up the silver. Silver chloride is insoluble in weak acid. “We’re looking for 90% on silver so it’s important to get that recovery as high as possible,” Lloyd said. During the restart, the mill was also upgraded with PLC controls that allow the technicians to see tons, power draw on the mills, water consumption, pump speeds, box levels on the flotation cells, etc. Process Engineering Resources, Inc. developed an on-stream analyzer (OSA) for the PLC system to track the flotation circuit’s performance. The OSA provides real time economics, which allows the mill to maximize concentrate grade. “We are able to look at cause and effect with chemical additions,” Lloyd said. “In addition to xanthate, we use an MIBC to stabilize the froth along with the sulphidizer and a glycol-based frother to bring the froth back after the sulphidizer. The technicians in the plant can see the cause and effects as they modify the amounts of reagents with the OSA. The people who run mills see assays for today’s products tomorrow and that’s too late. By having an OSA running on mathematical models created from assays in the lab at the mill, it’s almost gospel; it’s that close. We can run the plant and learn the cause and effect and maximize our economics continuously. Miller takes great pride in the mine’s environmental achievements. “The water leaving the mine site meets drinking water standards, but it does not meet aquatic standards because of elevated copper levels,” Miller said. “However, we have one of the best tailings storage facilities in the mining business, which acts as a natural water treatment plant. The tailings are ground quartz, which is essentially a benign beach sand. Within the first few inches of alluvium material, the copper is attenuated. A chemistry changes allows the copper to precipitate out of solution.” Monitoring wells surrounding the property verify the performance of this passive water treatment process, which upgrades the water to aquatic standards. In reality, the impoundment represents a minimal amount of disturbance. “We have been monitoring this site for 25 years now,” Miller said. “The impoundment is located on 750 acres of privately owned land. The footprint currently occupies about 350 acres.” Miller explained that the mine is fully funded for final closure reclamation, which he estimates at $6.5 million to $7 million. A $6.5 million bond has been placed in trust fund with AIG. Revett also has a $13 million surety bond within the state of Montana. The tailings disposal system begins at the thickener. Site boxes have been installed 20-ft deep to keep the pipes full. “We monitor the levels in the boxes and use a homemade valve system to control the level,” Lloyd said. “With pressure transmitters and alarms on the pipelines all the way to the impoundment, we have telemetry throughout the system. We can immediately identify a leak. If there is an issue, we have secondary containment. We also have automatic dump valves. We can shut the mill down and dump the line to limit environmental issues.” The decanted water overflows into a pond, where it its reclaimed immediately for the mine. The water from the tailings dam can be pumped back up if necessary. The impoundment progresses in 10-ft lifts. A fleet of Cat 631 scrapers deposits 3- to 6-in. on each pass until the lift reaches 10 ft. The impoundment is divided into four cells. “One of the biggest issues we have with the tailings impoundment is tails blowing off the lifts in dry summer season,” Miller said. “We use various means to control the dust.” Water pumped from the mine is fed by gravity to a set of sprinklers that irrigate and reduce the dust. The impoundment is not lined. Instead, Miller refers to it as a huge sand filter. Lake Creek, which sits 300 to 400 ft away is one of the premier Bull Trout ecosystems. “We have never had any impact on that ecosystem,” Miller said. Water sampling above and below the impoundment and at many locations around the mine show healthy amounts of macro-invertebrates or in fly fisherman speak, stoneflies and mayflies. “They are more sensitive than the fish and we have had no issues in 25 years of sampling,” Miller said. The Rock Creek ore body was discovered by Bear Creek Mining (Kennecott) in the early 1960s, and was later optioned to Asarco. As with Troy, Rock Creek was held 75% by Asarco and 25% by Kennecott. In addition to the Rock Creek claims, Revett also acquired some contiguous claims which were held 100% by Kennecott. Asarco explored the property from 1974 through 1983, expanding on the work previously started in 1966 by Kennecott. The permitting process commenced in 1987 when a plan of operations was submitted to the U.S. Forest Service (USFS) and the Montana Department of Environmental Quality (DEQ). The Rock Creek deposit is situated on USFS land, specifically within the Kootenai National Forest, and under the Cabinet Mountain Wilderness Area, and as such required federal, as well as state approvals to develop. The project, as proposed, is to be developed in two phases: (1) the construction and development of the Evaluation Adit and (2) the development of the mine and construction of the mill facilities. Revett recently won an appeal in the 9th Circuit on a ruling on its 2003 Record of Decision (RoD) and, with a few more permitting approvals and a revised RoD in hand, it will be in a position to construct the Evaluation Adit. The evaluation program will take 18 to 24 months to complete. Assuming the company can complete a positive feasibility study, gain the necessary construction permits and find the project financing, Revett intends to develop Rock Creek as a 10,000 tpd, room-and-pillar mine similar to Troy with conventional crushing and grinding of the ore followed by bulk sulphide flotation, producing a copper/silver-based concentrate that would be shipped to a smelter by rail. The Evaluation Adit will serve several functions, Miller explained. “There would be a 3,000-ft decline to get to the ore body,” Miller said. “Then miners would drive a 4,000-ft drift through the ore body with additional exploratory drill sites, proving up the resources. In addition to the exploratory drilling, a lot of geotechnical and geochemical testing would take place. We would also be looking at water quality.” Part of the permitting process includes a two-stage water treatment plant for the Evaluation Adit. Then the plant would serve the full blown operation assuming it is approved. As proposed, the Rock Creek mining complex would disturb eight acres for the mine site, 31 acres for the proposed mill site, and 368 acres for the tailings impoundment.“For Phase 1, we would have a support facility with an office,” Erickson said. “A core storage building has already been established.” The site has power and transformers. River is about 2,000 ft from the proposed Rock Creek tailings impoundment. The permits would include a whole package of environmental protection and mitigation procedures. For the Phase 1 Evaluation Adit, Revett has estimated cost of $2.6 million for the reclamation bond, $2.5 million for the grizzly mitigation program (See Grizzly Habitat, p.72), $4 million for the water treatment plant, and $6 million in construction costs for the Evaluation Adit. “For Phase 2, the reclamation bond could range from $45 million to $75 million for a $350 million capital investment to get the mine started,” Miller said. The mineral resources for Rock Creek are currently estimated at 136 million tons with a grade of 1.67 oz/ton silver and 0.72% copper for a total of 229 million oz of silver and 2 billion lb of copper. The Evaluation Adit is a two-year long program under exploration license for resource delineation to confirm hydrogeology, geochemistry, rock mechanics, and most importantly, feasibility. Once feasibility and financing is complete, it would take three years to commission the mine. “If we started today it would take five years,” Miller said. The 2003 RoD, issued by the USFS, along with the Biological Opinion, issued by the U.S. Fish & Wildlife Service, were challenged by various environmental non-governmental organizations (NGOs) in both state and federal courts on a number of occasions. In general, these challenges have been successfully defended by the federal agencies through the Department of Justice and by Revett as an intervener/co-defendant. Essentially, there were two main legal challenges. One against the RoD, which looks at all impacts in accord with the National Environmental Policy Act (NEPA) and one against the Biological Opinion, which addresses potential impacts to species listed as threatened or endangered. Because of overlapping issues in the two legal challenges, the challenges were subsequently combined by the District Court of Montana in 2008. In May 2010, the District Court of Montana dismissed the plaintiffs’ challenges relating to the Endangered Species Act (ESA) along with challenges to the Clean Water Act and Clean Air Act, but set aside and remanded the 2003 RoD to the USFS for further action with regard to NEPA procedural matters. The District Court identified several items requiring further clarification in the 2001 Final Environmental Impact Statement (EIS) and therefore required the issuance of a Supplemental EIS under NEPA. The items requiring further clarification included location of facilities near the buffer zone for the Habitat Conservation Areas, sediment mitigation measures during Phase I development, and incorporating several Supplemental Informational Reports into the administrative record. The NGOs subsequently appealed the District Court’s May 2010 ruling. In November 2011, the U.S. Court of Appeals Ninth Circuit upheld a May 2010 decision from the U.S. Federal District Court of Montana, dismissing ESA challenges to the proposed Rock Creek mine. Now work continues advancing the project through its next steps with the completion of the Supplemental Environmental Impact Statement (SEIS) and re-issuing the Record of Decision, hopefully by the end of 2013. For the Rock Creek project, Revett has committed to a comprehensive grizzly bear mitigation plan that is a major step toward creating a total recovery plan for the entire Cabinet-Yaak Ecosystem. The cost for this plan is estimated at approximately $30 million over the course of the 25- to 30-year life of the project. Most of the costs are associated with land purchases, monitoring, law enforcement and augmentative. The plan calls for 2,450 acres of habitat replacement. A trust fund has been established for two biologists and a fish and game officer for 30 years. “This mitigation plan did not have to be in place until construction begins on the Evaluation Adit, but we have been funding a biologist for three years now,” Miller said. The biologist has identified preferred areas of grizzly habitat, which may or may not be for sale. Revett has been able to purchase some properties. Some of which are old patented mining claims, while others were old timber company properties. “We are only disturbing 485 acres, but we are being asked to establish 2,450 acres,” Miller said. For the Cabinet Yaak Ecosystem, the goal is to grow the bear population to 90 to 100 grizzlies, Erickson explained. “Biologists believe there are currently 10 to 15 grizzlies in the Cabinet and another 20 to 25 in the Yaak,” Erickson said. “We are participating in an ongoing hair snagging project to better define that number.” Just as it sounds, hair samples are collected from barbed wire and cataloged by DNA. The U.S. Geological Survey does the work for the U.S. Fish & Wildlife Service. The studies are funded through private money. The county has put up money along with Revett and some private entities. A similar study was performed in Glacier National Park and the adjacent wilderness area that indicated that there were 900 grizzlies in that ecosystem.